Once upon a time, our planet was filled with fantastically big and delightfully weird creatures, and some of them looked a whole lot like animals we still see today. Only much, much bigger. Take a moment to marvel at these six gigantic extinct animals (also called megafauna) -- and their smaller familiar "cousins" still hanging around now. 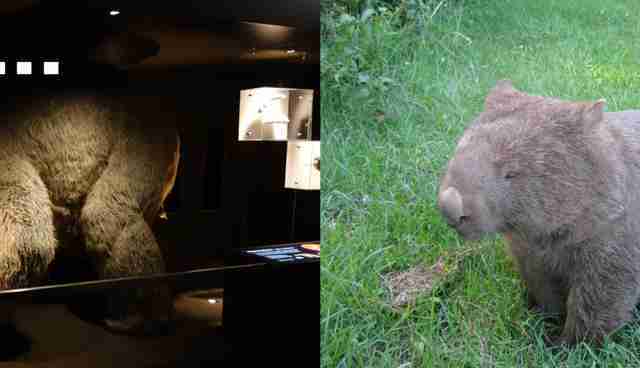 Today's wombats are cute lil fellows who romp around at about the size of a really fat house cat. But 50,000 years ago, their megafauna cousins weighed more than 600 house cats combined, estimated to break the scales at around 6,200 pounds. Meet the Diprotodon, the giant wombat which was like a huge furry marsupial hippo that noshed on Australia's leaves, bushes and grasses. How and when they disappeared: There's still plenty of debate, but many scientists believe the Diprotodon's extinction coincided with the arrival of ancient humans on the Australian continent about 50,000 years ago. Others theorize that Diprotodons coexisted with humans for thousands of years before their extinction. Either way, the loss of the last giant wombats was probably due to a mix of hunting and a long series of droughts that eliminated their food and water. Nearly 11,000 years before today's sloths won our hearts with their adorably lazy, chill selves, their crazy-huge cousins -- known as ground sloths -- loped around North and South America. 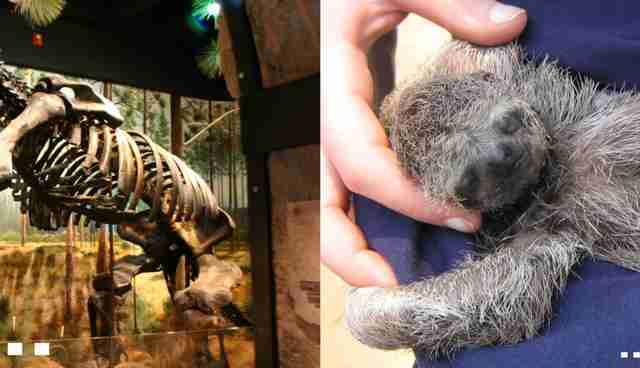 Scientists have found more than 20 different varieties of these super-cool, super-sized sloths. The largest (and awesomely named) Megatherium is believed to have weighed more than seven tons and stood 23 feet tall. How and when they disappeared: Like with the Diprotodon, scientists debate the reasons for the ground sloth's extinction, with disease and climate change both compelling theories. Still, the connection with human settlement is a strong one. In the area that's now the United States, ground sloths disappeared around 11,000 years ago -- right around the time when humans started settling there. Though they were thick-skinned and sported some wickedly terrifying claws, ground sloths were basically giant slow-moving targets for hunters, probably easy marks in the open grasslands. No one in their right mind would call today's rhinos small, right? 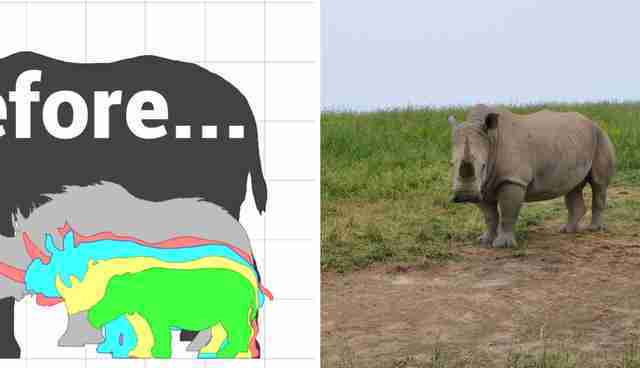 That is, until you compare them against their mega-huge ancient cousins, the Paraceratherium, who hold the record as the largest land mammals ever to roam the earth. Twenty-three million years ago, the Paraceratherium sauntered about in the forests of Asia, stripping entire trees bare with their teeth. The largest of the largest rhinos is estimated to have weighed as much as five elephants and stretched 26 feet long. How and when they disappeared: When faced with such ancient giants as these, paleontologists have their hands full in determining exactly when and how the world's mega-rhinos disappeared. Suffice it to say, the vast climate and ecological shift at the end of Oligocene epoch 23 million years ago (forests turning into grasslands, for example) was an over-riding cause. Armadillos are little guys today -- the smallest of the family, the pink fairy armadillo, is only a wee five inches long and weighs less than a pound. But back in the good ol' Pleistocene, their ancient relatives were the size of a vintage automobile! 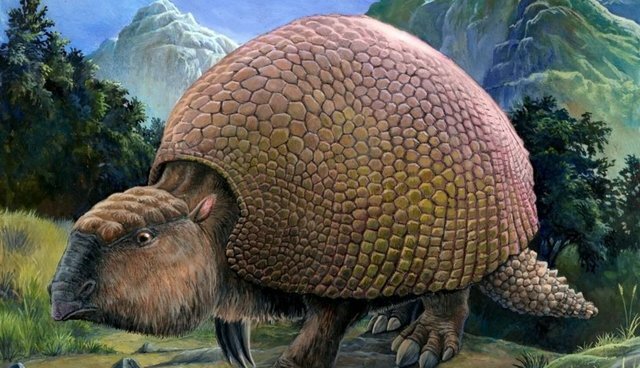 Meet the Glyptodon, a two-ton mammal with armor like a turtle, massive jaws and perhaps even an elephant-like trunk for a nose. 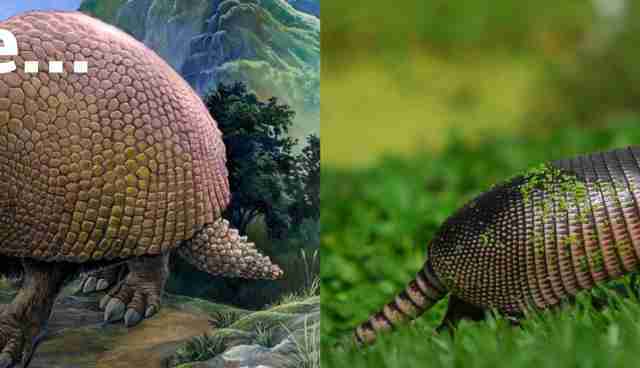 Glyptodons meandered around South America possibly as far back as two million years ago. Today, beavers weigh in as one of the world's largest rodents at an impressive 40 pounds. Yet they're puny in comparison to the great giant beavers (also known as Castoroides) that roamed North America as far back as 130,000 years ago. These rodents of unusual size were literally legendary; in the myths of one Native American tribe, a local mountain was formed when a giant beaver fell from the sky at the hands of an angry god. (Dam!) Castoroides grew to be eight feet long and weighed more than 200 pounds -- about the size of a black bear. Their teeth alone were six inches long! How and when they disappeared: Angry gods aside, there's no evidence right now that humans ever had any particular quarrel with Castoroides. 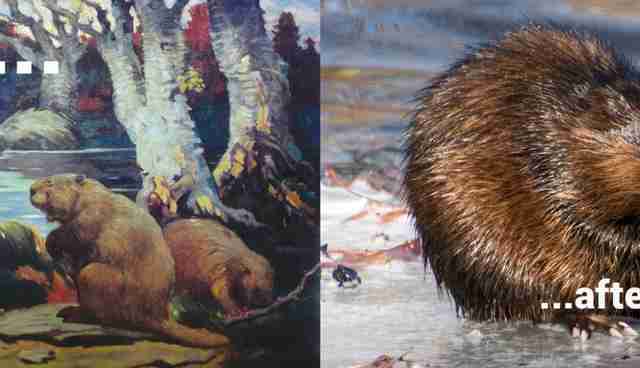 Still, these enormous beavers went extinct about 10,000 years ago, not long after humans arrived in North America. They, along with many other species, likely fell victim to the vast climate change at the end of the last ice age. The eagles that soar through our skies today awe us with their grace and fierce predator skills. They're threatening to the mice and other creatures they hunt, but ... not so much to us. Now, imagine an eagle with a wingspan 10 feet wide and a massive body weighing 30 pounds ... and then throw in an extra-sharp beak and vicious talons. Meet (and fear!) the Haast's eagle, the largest bird of prey in the world, which dominated the skies of New Zealand's South Island. 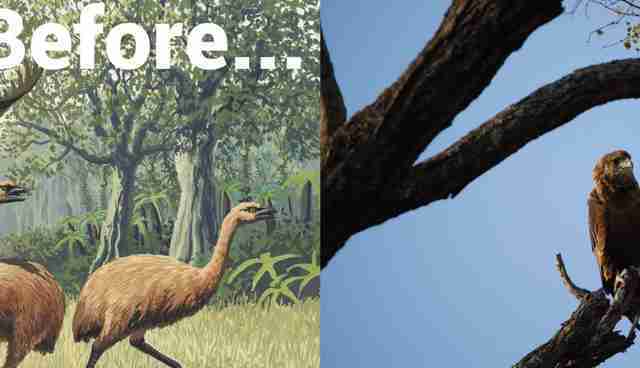 How and when they disappeared: The demise of the Haast's eagle was relatively recent; these giant birds of prey were still around as late as 1400 A.D. Their doomed fate is bound up with two other animals: the moa (the largest bird the planet has ever seen) and humans. The Haast's eagle was the only animal capable of hunting moa, and devoured them for centuries -- until the arrival of the Maori people in New Zealand shook up the balance. When the Maori hunted the moa to extinction, Haast's eagle soon followed. If there's one thing we can learn from these huge-mongous megafauna, it's that we're only still just coming to understand the impact that we human animals are having on the history of our planet and the magnificent myriad species that we share it with. Today's remaining megafauna -- elephants, hippos, rhinos, whales, manatees and more -- are also some of the most imperiled species left in our world. Between poaching, habitat loss and climate change, conservationists predict that the world's last large animals could end up going the way of the Diprotodon and the ground sloth in as little as 20 years. But with a growing understanding of our impact comes a growing sense of our own responsibility, too. Let's appreciate the lost wonders of the world and fight to save the wonders we have today, while we still can.